MEDERIS is proud to announce the new NeuroGain"S" in Eco-bottle in Singapore, Korea and soon in Malaysia. NeuroGainPB, NeuroGainPB300 for Pregnant & Lactating Mum. Ganilia (All in One Formulation of DHA,Multivitamins & microencapsulated Iron) for Pregnant & Lactating Mum. NeuroGain "S" DHA pre-natal vitamin for pregnant and breast-feeding women helps provide you with the daily requirement of DHA that may be lacking in your diet. DHA is an important nutrient for your baby during pregnancy and while you are breast-feeding. The new NeuroGain "S" vegetable softgel capsule provides 383mg of DHA. By taking one easy to swallow NeuroGain "S" softgel per day, you can meet the recommended level of DHA for pregnancy and breast-feeding. This ensures that your baby will receive the proper amount of DHA in addition to most pre-natal vitamins. rich and omega 3 poor); Allergic to fish and eggs. *Pregnant women with a history of low birth weight babies, pre-term births. *Closely spaced or multiple pregnancies. your own omega 3 fatty acids. “Both Omega 3 and Omega 6 Essential Fatty Acids (EFAs) are essential but our body requires them in a ratio that is not normally achieved by the typical diet of today’s industralized nation. They must be consumed regularly as our body has limited storage for them”. Docosahexaenoic Acids (DHA) is an important for pregnant and lactating mothers because it helps to promote proper brain and eye development in fetuses and infants. 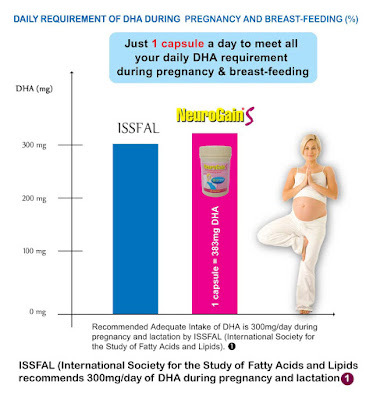 ONLY ONE (1) capsule of NeuroGain S Vegicaps a day to meet ALL your daily DHA requirement during pregnancy & lactation. Highly Concentrated form of DHA (High DHA, Low EPA) allows you to receive the full recommendation of DHA withouth the risk of receiving excessive EPA. Conventional fish oil naturally rich in EPA is not suitable during pregnancy and breastfeeding as may lead to increase of blood loss at the time of delivery. Made possible by molecular distillation and with removal of PCBs and heavy metals to minimise risk of contamination. No Paraben. Reduce Carbon Footprint & Environment Friendly. 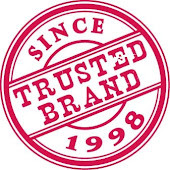 The Pioneer in Pharmaceutical Industry! + Please consult your Doctor and Pharmacist for professional advice. The information provided herewith is general in nature and is not meant to replace proper consultation and follow-up by healthcare professional. Every patient has special needs which require personalized attention. NeuroGain range of product include NeuroGainPB, NeuroGainPB300, Ganilia, NeuroGain90 (Children) and now the new NeuroGain"S" in Eco-Bottle!